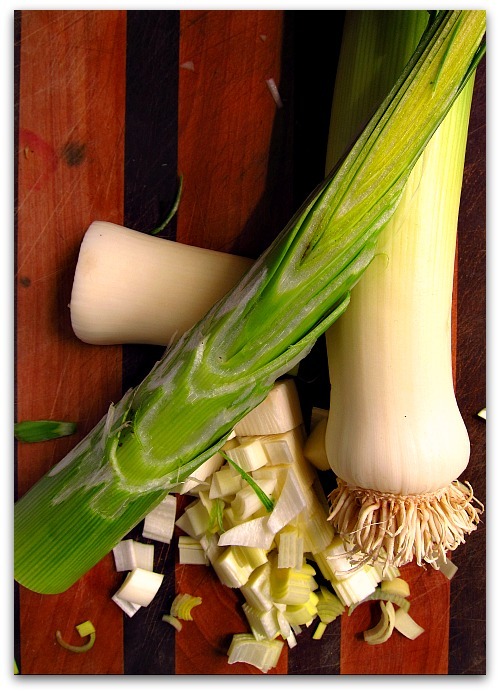 A leek is an extra-special onion. I have crop envy. My pals at Island Meadow Farm grow leeks the size of lodge poles . Joe and Celina from Sun Island Farm offer up tender baseball-size turnips with the sheen of a polished pearl. On the east side, Greenman Farm does just about everything right, while Hogsback Farm can produce an heirloom tomato that makes me weep. When it comes to shallots, I look no further than Pacific Crest to stock my larder. Vashon is blessed with some gifted farmers, and thanks to their growing talents (and occasionally mine), the soup is always on! Now that leeks are in season, and because mine resemble wimpy little scallions, I picked up a generous bunch from Island Meadow Farm. Teamed with my remaining spuds, I can produce one mean vichyssoise, but for practical reasons of not wanting to freeze up my spellchecker, I will herein call this fine dish potato leek soup. 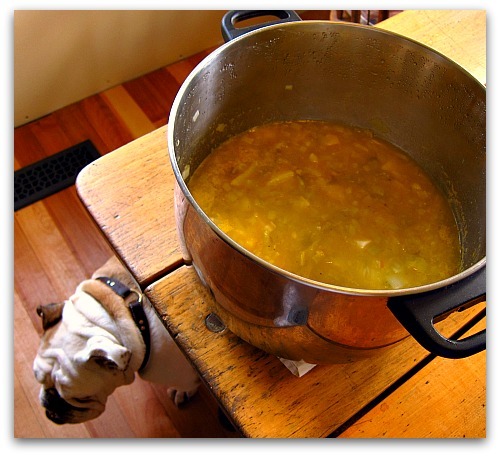 Chunky but soft soup before pureeing (while Boz guards the stockpot from would-be tasters). The recipe, adapted from Alton Brown, is a favorite: simple, hearty, creamy and delicious. In a large stock pan over medium heat, melt the butter. Add the leeks and salt and sweat for 5 minutes. Decrease the heat to low and cook until the leeks are tender, approximately 25 minutes, stirring occasionally. Add the potatoes and the vegetable broth, increase the heat to medium-high, and bring to a boil. May be served cold or warm. One my favorite soups serve warm or cold any time of the year. Creamy Potato Leek soup is perfect on a rainy day. I discovered many years ago that the best thing ever to dip in Potato Leek soup is a plain bagel. Try it, you’ll thank me! I make one very similar to this, but use yogurt instead of buttermilk and add asparagus cut in small pieces. I will have to try the buttermilk next time. Yum! Buttermilk adds such a special tang – who’da thunk it and those leeks. Crop envy for sure. Looks fabulous Tom. Thanks for the recipe. I need to use up my leeks! don’t forget two fantastic last minute additions: sorrel leaves or nettle leaves! Tom – this soup looks delicious! 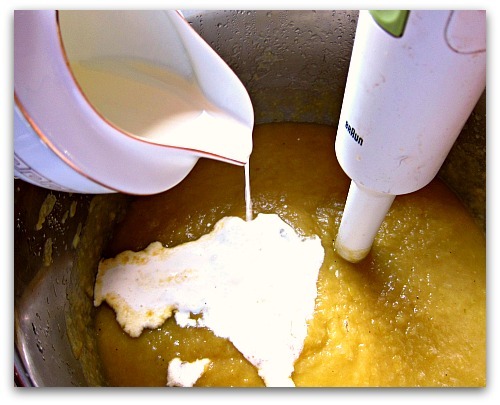 I have never used buttermilk in a soup before – a must try, yummm! This is my kind of soup! It’s on my menu for our rainy weekend ahead. This look sooo good! I’ll look for leeks at the Proctor (Tacoma) Farmer’s Market this weekend. There was talk about Alton Brown around the staff lunch table today at good old (new) Baker Middle School – he explains HOW the sugar crystallizes on the inside of the pot in which you are making jam – fun! Science and food – how good can it get? Tess the Lab sends greetings to Boz and Gracie! I found your site on accident, and boy am I glad I did. You are a neighbor (I live in the Maple Valley area) and your posts, photos, and recipes are just wonderful. I would love for you to link up this recipe on my Seasonal Eats May roundup found here, which highlights posts about using seasonal ingredients in great recipes. Tom, my favorite soup and your recipe sounds rich and delicious. One trick I learned in France is to take the green stalks that you cut off and usually discard and put them in your stock to boil/simmer for about ten minutes. Them strain them out. The stalks add a nice flavor to the stock. 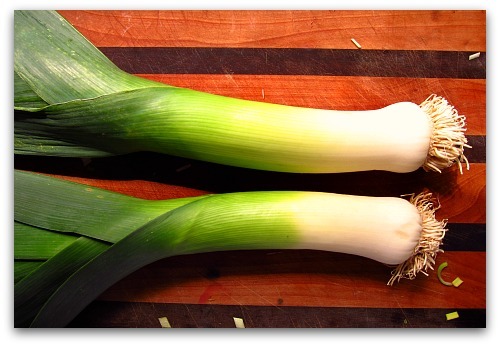 I can almost smell the leeks from your photo. Great tip Mike! One I will use from now on. More flavor and less waste! This soup is really comfort food. 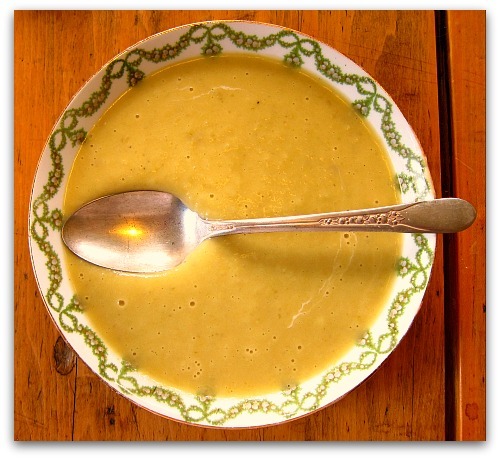 It is also a typican classic Belgian soup!